“Earwitness” (2018) gives the objects and text to you but leaves sound out, so you can imagine it. This is the second article I am writing in less than a month about an artist who has done work on the Syria war, a war that represents a threshold in the current political atmosphere in the world. My previous article focused on the images of war by a hearing-impaired boy and his narrative told by his gestures. In the article, I delve into questions of not featuring images of those who physically witnessed the events in Syria. How it is possible to show without images? Can we hear war? Is it true that sound creates an image in your brain? Is there a difference between seeing and hearing? Maybe it is not possible to answer all these questions, but sometimes it is also more important to ask the questions rather than in finding the answers. My first encounter with Lawrence Abu Hamdan's work was at the International Rotterdam Film Festival in 2015 where his short film about noise pollution in Cairo was featured. He describes himself as a "private ear" and an artist. 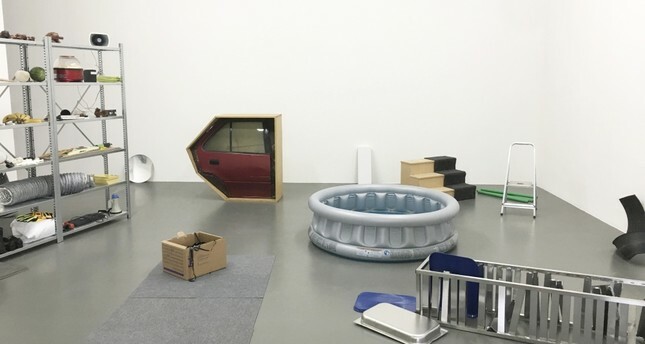 You immediately understand what he means when you experience his current solo show at the Witte de With Center for Contemporary Art in Rotterdam. "Saydnaya (the missing 19db)" (2017) emphasizes how sound was used in the Saydnaya prison as torture. Abu Hamdan features "Earwitness" (2018) and "Saydnaya (the missing 19db)" (2017) that convey political effects through the hallucinatory world of the "earwitness" and "Walled Unwalled" (2018), which the artist produced with the Forensic Architecture research agency at Goldsmiths University in London that investigates Saydnaya prison near Damascus. The show is curated by Rosa de Graaf and can be visited until April 28. I remember seeing the investigation that Forensic Architecture published on their website which focuses on the detainees of Saydnaya prison. Forensic Architecture conducted interviews in Istanbul as Turkey hosts around 3.5 million refugees from Syria, with five survivors from Saydnaya prison. Since the war began, no journalists or monitoring groups have been able to visit the prison or speak with prisoners. "As there are no images of Saydnaya. The researchers were dependent on the memories of survivors to recreate what was happening inside." So, the whole investigation was based on the memories of the people who survived it. Forensic Architecture reconstructed the prison via 3D models from the testimonies. The witnesses added objects they remembered, from torture tools to blankets and furniture, to areas where they recalled them being used. The recollections sparked more memories as the model developed. As Abu Hamdan worked on this investigative project, he also wanted to respond to what he witnessed during the interviews by calling it the "conflicted memories and memories of conflict." There is a shipping container style black box, painted white, in the middle of the exhibition space. Sometimes sounds leak out of the box. It catches your attention but feels scary as you enter the space. Is it a video room or something else because even the glass on the door of the black box is coated? I wanted to try my chances and did. It is a dark room; it lets light in as you enter. It is quite claustrophobic. There are chairs in the room, so you are invited to sit down because it is not easy to see when the door is closed. Everything is in place the moment you are ready to experience the work. Your sense of sight is blocked, so your sense of hearing sharpens, which helps you to focus on the sounds coming from the loudspeakers that are placed in the corners of the room. "Saydnaya (the missing 19db)" (2017) emphasizes the sound in the Saydnaya prison, the torture and even the silence. Detainees would start to whisper to each other; sometimes they heard sounds from other cells, but they never saw anyone. It was only sound. The artist invites us to experience that atmosphere in a darkened space, using sounds that he got from the survivors' testimonies. It is a strong work that demolishes boundaries between the subject and the audience with the experience. I guess it is hard to stay inside for a long time due to the harshness of the experience and darkness. The space itself has the atmosphere of a prison used in the narrative with its darkness. It immediately creates shocking images in your brain, depending on your imagination. I began to realize what space does, what space represents and how it quickly captures your imagination when it is darkened. It is also interesting to think about how sound works in terms of creating space. The installation turns into an abstract representation of the prison where visitors can experience a relationship with sound, silence and darkness as a means of torture. "Earwitness" (2018) is another work presented on the second floor of Witte de With that occupies two rooms. As you enter the space, the room on the right-hand side is filled with lots of objects spread out through the space. It is normal to see an artist who re-contextualizes daily life objects for the sake of art in a museum, but Abu Hamdan's intention is different: He uses these objects to create his sound inventory. Each object on the floor represents juridical cases. Abu Hamdan has produced a video placed across the objects. Abu Hamdan has created this work with collaboration with David Rienfurt. The artist created the script and read it on a computer. The video placed on the wall plays back via a speech-to-text algorithm software designed by David Rienfurt. The work is about the sound of the objects and their related juridical cases but there is nothing to hear. It is a sound piece, which you cannot listen to. The artist wanted to have only "Saydnaya (the missing 19db)" (2017) as a sound piece that could be heard which created images in your brain. However, "Earwitness" (2018) gives the image and text but leaves the sound out. So, it is up to you to imagine the sound.